Allen Hurns on the trading block? 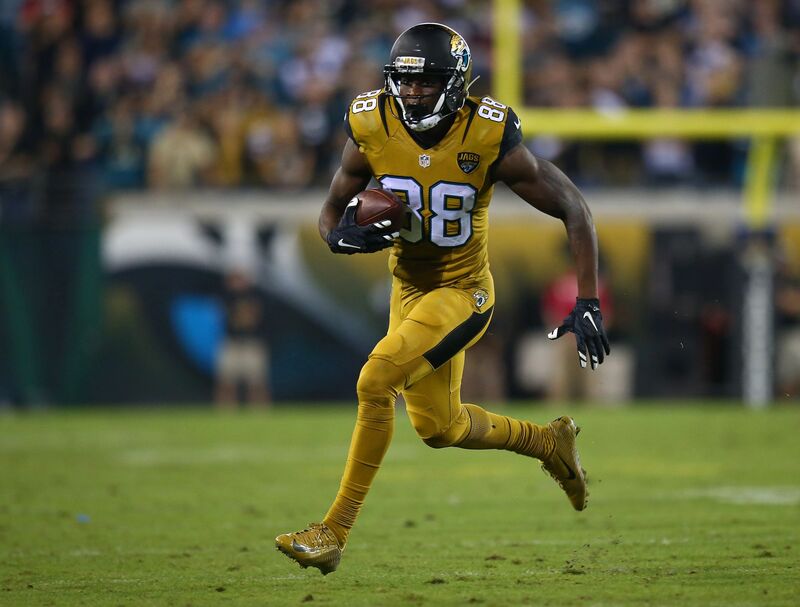 With uncertainty at quarterback, the Jacksonville Jaguars may be looking to trade wide receiver Allen Hurns. The intrigue surrounding the Jacksonville Jaguars so far this preseason has centered around the quarterback situation, with Blake Bortles continuing to regress and Chad Henne in the mix to take the starting job. But according to Ryan O’Halloran of the Florida Times Union, there’s something to speculation about wide receiver Allen Hurns being on the trade block. Hurns has been practicing, and by all indications is healthy. But he has not played in either of Jacksonville’s two preseason games thus far, which has fueled trade speculation. The team’s third preseason game is Thursday night against the Carolina Panthers, so if Hurns is not active yet again he may be as good as gone. Like most Jaguars’ receivers, spurred by a drop-off rom Bortles, Hurns’ numbers fell of last year. He had 64 receptions for 1,031 yards and 10 touchdowns in 2015, but finished with just 35 catches for 477 yards and three touchdowns over 11 games last season. A severe hamstring issue sidelined him for the final five game last year, but Hurns signed a five-year, $40.6 million deal ($20 million guaranteed) after his 2015 breakout and he seemed to have a long-term place in Jacksonville. But a change in front office regime, with Tom Coughlin leading the way from the top, has apparently changed the organization’s thinking on Hurns. In theory, the Jaguars do have good wide receiver depth. But beyond Allen Robinson, there are question marks. Marqise Lee hasn’t really asserted himself yet, Rashad Greene hasn’t shown much and rookies Dede Westbrook and Amba Etta-Tawo are not proven commodities. Trading Hurns for another team’s disposable quarterback, or an extra draft pick, could be the plan for the Jaguars. But that would be a clear sign of another reset/rebuild offensively, with younger players in line for bigger roles in the passing game.